I suppose it was only a matter of time. The sanctity of the ‘one and only original 2D artwork’ had already been breached with the advent of print-making (and possibly even high-end photography), and even making an exact facsimile of a 3D sculpture (by making a mould of the original) is not unheard of (click ‘here‘ to learn how this company makes Rosetta stone replicas from first-generation scans of the original). “The burial chamber of King Tutankhamen is currently in Madrid. OK, it’s a re-creation. But it’s a near-perfect re-creation, down to the paint on his sarcophagus. Made by arts workshop Factum Arte, the copy is awaiting transport to Egypt, as soon as the political situation there calms down. 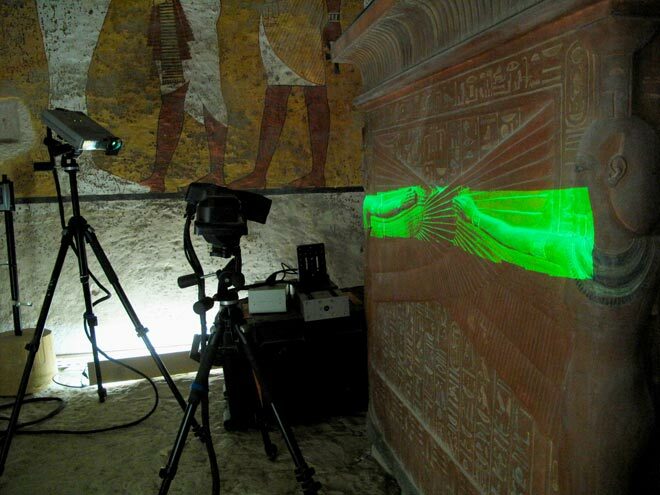 Factum started the knockoff in 2009, hauling truckloads of equipment into the Valley of the Kings to make detailed scans of the real tomb. By the end of seven weeks, the team had captured everything, even ancient graffiti. Back in Spain, they used a computer-controlled milling machine to cut reliefs out of polyurethane panels, which were molded in silicone to form the walls. The paintings were printed on Papergel, a flexible material that applies easily to uneven surfaces. The studio has used a version of this technique to re-create oil paintings like da Vinci’s Last Supper. Such “noncontact conservation,” as Factum Arte founder Adam Lowe calls it, means tourists—and their cash—can flow into historical sites without wrecking them. The copy will soon be your best option. Tut’s actual tomb is slated to eventually close to all except those willing to pay thousands to see the boy-king.” Unquote. I have never heard of a technology that can reproduce a complicated 3D object like a tomb. Think about it; the company not only made scans of the details of the tomb walls, but it also (1) use the scanned details to cut exact reliefs (I.E. 3D features including all minute bumps and grooves) using a computerised machine, and (2) then the colours are printed on a flexible material that is then pasted onto the exact reliefs. Result? Not just a ‘perfect’ 2D ‘visual’ of how the tomb looks like (like how good photographs of the tomb with good printed-colours can already achieve) but a ‘perfect’ 3D version of every nuance of the details of the tomb. But what does this mean? Picture this; a great high-megapixel photograph of van Gogh’s Sunflowers will capture the colours accurately, but the 3D technology can not only capture that, but also the raised/sunken bumps caused by his liberal use of oils (which results in subtle shadows in his paintings, giving it an unnerving depth when seen in real life). Purists will scoff at the idea that unique works of art can be ‘replicated perfectly’, and even if ‘perfection’ is nearly possible, they will say that nothing beats the real thing. I agree; the original is undoubtedly the best. But then again, not many people can afford the money to travel to Paris to see Mona Lisa or Egypt to see King Tut’s tomb, no matter how great a fan they are. This 3D technology now makes it possible to bring 2D and 3D art of any kind to any part of the world, at a fraction of the cost of shipping the real artworks (and provided that owners even want to ‘lend’ them out in the first place; try asking the Louvre to let Mona Lisa travel… And also, some artworks, like the wall-paintings in the Vatican, simply cannot travel). Snobs may not attend such an exhibition, but we know that many people would be glad to see what must be very close ‘second-bests’ exhibited in their home country, with an entry-ticket costing only a mere fraction of actual overseas travel-fees. I just wonder if in the King Tut exhibition in Spain they had also reproduced the actual smell, dust and humidity of the actual tomb? I can only hope to see such an exhibition one day and write my post-visit thoughts here.